$9/person, children 3 and under eat free. There will also be a video arcade bus, a magic show and face painting. 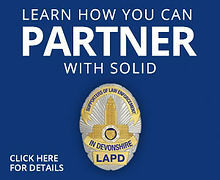 First, we provide the officers in the Devonshire Division of the Los Angeles Police Department with resources which the City of Los Angeles does not provide. Secondly, we support Community Policing. Everything donated to S.O.L.I.D. remains in the Devonshire Division and is used for the enrichment of the Devonshire Community. S.O.L.I.D. 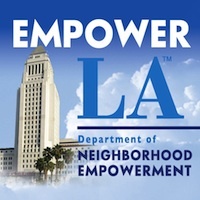 is a California 501(c)(3) non-profit and was formed in 1990. We continue to thrive with S.O.L.I.D. support from individuals and businesses in our local area. 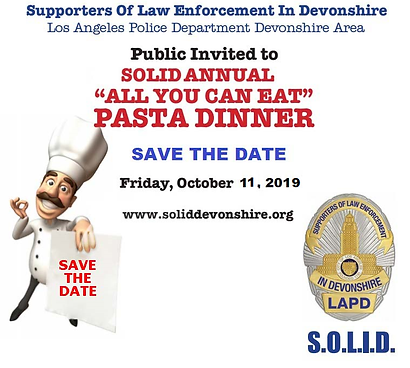 Every year the community supports our two main fundraisers, the Annual Pancake Breakfast, which is held in May and the Annual Pasta Dinner, which is held in October.